The STAR Community Rating System is the nation’s first comprehensive framework and certification program for evaluating local sustainability, encompassing economic, environmental and social performance measures. This announcement is a major next step specifically for the Community Events Division, which has long been working to make the City’s signature events greener and more environmentally friendly. In 2011, the Mayor’s Office of Sustainability and the Community Events Division, in partnership with FPL, installed solar panels above the trellises on South Clematis Street to provide sustainable electricity to vendors and visitors. Most recently, in 2016, the Community Events Division initiated a recycling program for all City of West Palm Beach events, which in addition to the GreenMarket includes Clematis by Night, 4th on Flagler, Screen on the Green and Sunday on the Waterfront, among others. To make an even farther-reaching impact, the City is also planning to give away more than 5,000 metal straws starting on opening day. 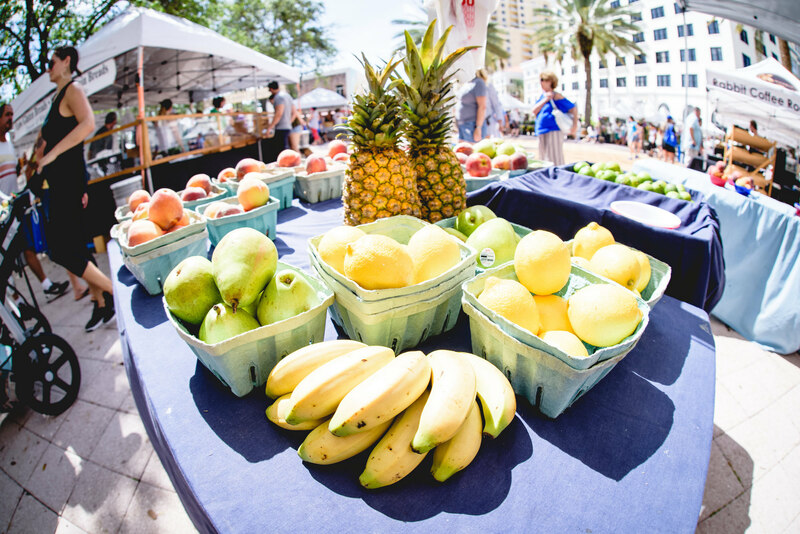 The promotion aims to encourage GreenMarket patrons to continue sustainable practices once they leave the Market, thereby spreading sustainability throughout the entire Palm Beach County community. This year’s GreenMarket theme, “We PRODUCE Fun for Everyone,” is apparent in the beyond-the-produce fun that is available for visitors of all ages. 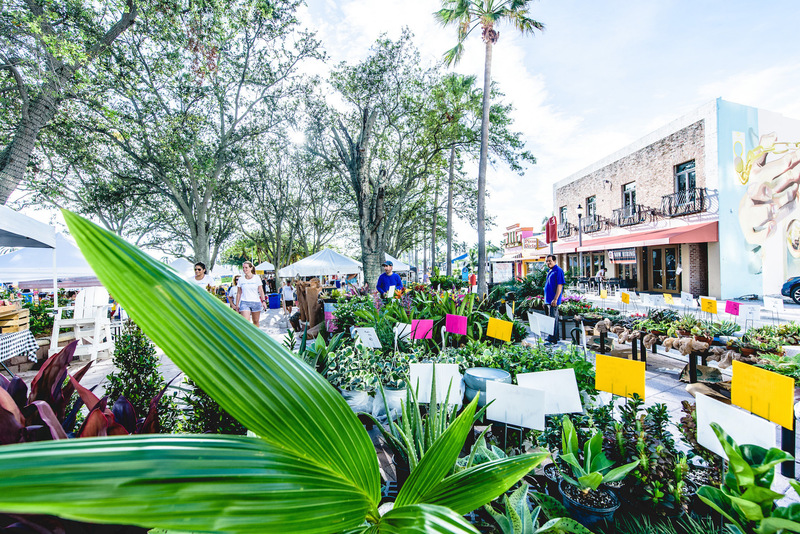 In addition to the local vendors, the GreenMarket also features live music, unlimited mimosas for $10, free activities for kids, and plentiful green space and seating, which creates a morning full of fun and relaxation. Additionally, on the third Saturdays of the month, starting in November, visitors can take advantage of “By the Banyan” walking tours, which point out key historical locations throughout the downtown community. In conjunction with the Richard and Pat Johnson Palm Beach County History Museum, the tours are led by local architect and historian, Rick Gonzalez, and start by the large banyan tree on North Clematis Street. Tickets are $10. The West Palm Beach GreenMarket is produced by the City of West Palm Beach Department of Parks and Recreation, Community Events, and will run weekly through Saturday, April 20, 2019, except for Saturday, March 30, 2019, due to the Palm Beach International Boat Show. The GreenMarket is friendly to dogs on short leashes and is always free. Parking is available in two City garages, both just blocks from the waterfront. Parking is free in the Evernia/Olive garage during market hours and a flat fee of $5 in the Banyan/Olive garage before 1 p.m. Those interested in arriving by boat can also take advantage of the City’s free public docks. Locals and visitors are also encouraged to arrive the sustainable way – on City’s free and fun trolley. The incredibly popular transport system cuts down on CO2 emissions by eliminating car trips and has several routes, including the Yellow Line, which has several stops near the GreenMarket. GreenMarket sponsors-to-date include: Jupiter Medical Center, Land Rover Palm Beach, Jaguar Palm Beach, Hilton WPB, WIRK 103.1 FM, SUNNY 107.9, WPB Magazine, The Palm Beach Post, Palm Beach Daily News, Palm Beach Medical, WPB Marriott, Rhythm & Hues and JetRide. The GreenMarket takes place on the corner of Flagler Drive and North Clematis Street at 101 North Clematis Street, West Palm Beach, FL 33401. For more information about the West Palm Beach GreenMarket and other waterfront events, visit wpb.org/events, call 561-822-1515 or follow the City of West Palm Beach on Facebook @CityofWPB and on Twitter and Instagram @westpalmbch. New vendors this year include: Aioli; BMORE crabcakes; Cocowatt; Eddie’s Dark Chocolate; Fresh Home Made; Holly’s Natural Products; Mi Casa Tu Casa; MONDEPICE; Naughty Nutty Love; NüGrub Vegan Products; Primordic; Soukie’s Spring Rolls, Bowls, & More; Strudel Z; and The Cheese Shoppe. Returning vendors this year include: Airblooms; ARTPIE; Bee Unique Everything Honey & More; Boston Chowda; Brucesghostpepperz.com LLC; Bubbly Boba; Bushdogs ; Celis Produce; Christy’s Fresh Catch; Cider Doughnuts; Cottage Garden Teas; Danemilys flowers; Doctor Pickle; DOGDELI CANINE KITCHEN; Don Victorio’s Market; Dreamallows; Farmhouse Tomatoes, Inc; Farriss Farm, LLC; Field of Greens; Florida Raw; Frik & Frak Foods; Gables Delight; GFoodZ; Good Dog Bakery; Gracie’s Greens; Gratitude Garden; HADAYA SPICE; Havana Restaurant; Heavenly Orchids; Icestasy; Importico’s Bakery Café; J and J Seafood; Jerry’s Here Farm Fresh; Joe’s Herbs and Ornamentals; Joy’s International Foods; La Montagne Des Savers; Laurel Orchids; Laurie’s Pantry; Le Coin a Crepe; Le Petit Pain; Leila restaurant; Loic Bakery Cafe Bar; Love’s Flowers/ Todd Baker wholesale; LOX FARMS; Macy’s Smoked Fish & Dip; Makebs; Margie exotic plantscapes; Moonlight Radiance Artisan Market; Mosquito Mud Pottery; Mozzarita; Nisha’s Flavors of India; OLIVE OIL OF THE WORLD; PASCALE’S LLC – THE DELRAY BEACH JAM COMPANY; Pasta Amore; Poke smash; Pumphouse Coffee Roasters; R & R Orchids, LLC; Rabbit Coffee Roasting Co; RAWMANTICCHOCOLATE; SANCTUARY EXOTIC TEA; Sassy Palate; Saturday Morning; Seaside Smoothie; Supernaturals LLC; Swank Specialty Produce, Inc.; SWFL Produce; Taspen’s Organics; Taste and See Creations; The Ceviche and Guacamole House; The Gourmet Pickle Peddler; The Green Bar; The Purple Shrimp; The Three Plant Ladies of Homestead; TocToc Arepas; Trapical oasis; Turnstyles Woodturnings; Wet Nose Pantry; Wildflower Granola; and Wonders of Nature.